West to you no matter where you live. We know God is smiling ! children except silence, patience and tears." Let not many of you become teachers, my brethren, knowing that as such we shall incur a stricter judgment. For we all stumble in many ways. If anyone does not stumble in what he says, he is a perfect man, able to bridle the whole body as well. Now if we put the bits into the horses' mouths so that they may obey us, we direct their entire body as well. Behold, the ships also, though they are so great and are driven by strong winds, are still directed by a very small rudder, wherever the inclination of the pilot desires. So also the tongue is a small part of the body, and yet it boasts of great things. Behold, how great a forest is set aflame by such a small fire! And the tongue is a fire, the very world of iniquity; the tongue is set among our members as that which defiles the entire body, and sets on fire the course of our life, and is set on fire by hell. For every species of beasts and birds, of reptiles and creatures of the sea, is tamed, and has been tamed by the human race. But no one can tame the tongue; it is a restless evil and full of deadly poison. With it we bless our Lord and Father; and with it we curse men, who have been made in the likeness of God; from the same mouth come both blessing and cursing. My brethren, these things ought not to be this way. Does a fountain send out from the same opening both fresh and bitter water? Can a fig tree, my brethren, produce olives, or a vine produce figs? Neither can salt water produce fresh. A gentle answer turns away wrath, but a harsh word stirs up anger. The tongue of the wise makes knowledge acceptable, but the mouth of fools spouts folly. "GENTLE WORDS ARE MORE POWERFUL THAN ANGRY WORDS." This quote is from Our Daily Bread - October, 2007 Issue. the old things passed away; behold, new things have come." Work even or continue even in pattern means that you keep working the same stitches or stitch combinations as before... keeping the same stitch pattern until the piece is the size indicated. Allow extra time for making crocheted Christmas gifts. Sometimes it takes longer than we think to finish a project. plan on finishing gifts for your child's teacher or for your co-workers before November ends. do you have number 40? The puff stitch is easy once you get the tension correct. YO does mean to yarn over. When you yarn over and pull up a loop that puts two loops on the hook. Thanks for writing. There's only one row of puff stitches (R18). The post stitches on Rows 20 & 21 make the edge textured. I am trying a new pattern with a term I’ve never seen before. If your pattern had you work a double crochet in each stitch on the previous row.. then working even would be to work a double crochet in each stitch on the next row. The joining color, unless a pattern specifies, it pretty much up to you. Most times I go with the main color in the pattern to use for the joining color. Thank you for your testimony. It is encouraging and uplifting to hear others give praise to our Savior Jesus Christ. I just found your site while looking for another that I was on last week. I was looking for a real easy cross book mark to do for a ladies Bible study group I will be facilitating in Jan. in conjunction with our Ladies Ministry at our church in Sebring FL. We are now in PA. and ending our 6 months here. We will be off line here as of tomorrow but when we return to FL. I hope I can find your web site again. We will not be at home until Nov. 1, Lord willing after visiting family in NJ and friends in TN. PS My husband Nick and I also watch John Hagee when we are able. Love your dog sweaters. Do you happen to have any that are knitted? I have no crochet talent! Thanks! 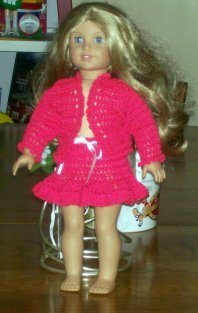 I made your skirt and sweater in Luster Sheen and size F hook; it turned out real pretty. Below is a picture of the outfit. There are many crochet patterns on the market that look similar; when, in fact, the crochet stitches that make up each pattern are very much different. I designed my pattern by looking at a really old afghan and working various stitch combinations to achieve the pineapple look in my square. I did not and will never "copy" another person's pattern. In this instance to "single crochet evenly" means to work one single in each stitch or row end around the afghan. Keep in mind you will need extra stitches in the corners in order for your afghan to lay flat. 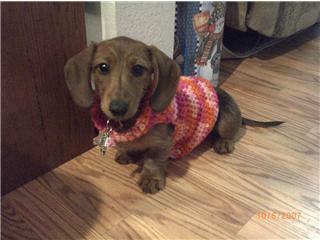 I made this sweater for Kimi, our mini dachsund who is 15 week old and weighs 4.5 lbs. I made lots of adjustments because she's small. Instead of joining the chain to make a circle, I turned around and start with hdc. I did this so that the sweater will be easy to put on the doggie. I just put 3 buttons on the opening (in the belly) and the button easily goes thru between the hdc. Thank you for the pattern, it's easy to follow and the sweater is easy to make. You're very welcome Ida. Glad you enjoyed the pattern. A guy in our church had a little crocheted circle someone had made him. He carried it in his billfold to remind him to pray. I thought that was a great idea so I made a flower. I've included your comments in the October 15th issue of the CNM Newsletter in hopes that Bonnie will see it. I do not have any contact information for her at this time. I manually added your email address to the mailing list for the CNM Newsletter. The next issue is scheduled for October 15th. Please let me know if you fail to receive your copy. Get your patterns published ! In our e-book you will find online shops & specials. and alot more specials going on. Two elderly gents met up on the way to the funeral of one of their longtime buddies. The deceased was thought to have accumulated much wealth. On the way to the cemetery, one old fellow asked the other, "How much did he leave?" The other old fellow replied, "All of it." The local phone book has only one yellow page. You don't signal turns because everyone knows where you're going, anyway. No social events can be scheduled when the school gym floor is being varnished. You call a wrong number and they supply you with the correct one. Everyone knows all the news before it's published; they just read the hometown paper to see whether the publisher got it right. Mrs. Golden was shopping at a produce stand in her neighborhood. She approached the vendor and asked, "How much are these oranges?" "Where's the package?" I asked suspiciously. The deliveryman held it up. I'd probably just use these." And he pulled out the keys I had left in the door. WE'RE really living in an animated society. it automatically activates the horn of the car behind you. TWO MEN were stranded on a desert island. One was very worried, while the other seemed to have no cares. "How can you be so happy?" asked the worried man. "We may never get off this island." "I make $100,000 a year," the other man said. "What does that have to do with us getting out of here?" asked the worried man. "I tithe," said the other. "My pastor will surely be coming after me." A FARMER had trouble sleeping, so he went to a doctor. The doctor told him to walk 3 miles a day for a week, then call him. After the week was up, the farmer called and said, "I did just as you said, Doc." "How do you feel now?" asked the doctor. "Much better," the farmer replied, "but I'm 21 miles from home." A LONG, long time ago, God was mopping His brow after finishing a difficult task. "Whew! I just made 24 hours of alternating light and dark," He said. A nearby cherub asked, "What are You going to do now?" God replied, "I think I'll call it a day." "Well, to tell the truth, Doc, yes," answered the patient. "You see, I seem to be getting forgetful. No, it's actually worse than that. I'm never sure I can remember where I put the car, or whether I answered a letter, or where I'm going, or what it is I'm going to do once I get there -- if I get there. So, I really need your help. What can I do?" The young suitor was determined to win the heart of the girl he wanted to marry, in spite of her rejection of his proposals a number of times. He began what can only be called "Campaigning" and sent her a small token of his affection every day for a month to her house. Soon, the young lady fell in love with the UPS man. "If I baked these commercially, how much do you think I could get for one of them?" Without looking up from his paper my husband replied, "About 10 years." You can take the boy out of the auto business, but you can't take the auto business out of the boy. I was walking through the door after an appointment with the beauty salon to have my hair colored, and then the chiropractor, when I heard my husband on the phone with my son. "She's not in," he said. "She's gone out for a paint job and a realignment." "My childhood was rough. Once for my birthday my old man gave me a bat. When there's only one other person in the elevator, tap him on the shoulder and then pretend it wasn't you. Ask if you can push the button for other people, but push the wrong ones. Call the Psychic Hotline from your cell phone and ask if they know what floor you're on. "Hi Greg. How's your day been?" Drop a pen and wait until someone goes to pick it up, then scream, "That's mine!" Move your desk into the elevator and whenever anyone gets on, ask if he has an appointment. Lay down the Twister mat and ask people if they would like to play. Pretend you are a flight attendant and review emergency procedures and exits with the passengers. Ask, "Did you feel that?" When the doors close, announce to the others, "It's okay, don't panic, they open again!" Grimace painfully while smacking your forehead and muttering, "Shut up, all of you, just shut up!" Crack open your briefcase or purse, and while peering inside, ask, "Got enough air in there?" Stand silently and motionless in the corner, facing the wall, without getting off. Stare at another passenger for awhile, then announce in horror, "You're one of THEM!" and back away slowly. Wear a puppet on your hand and use it to talk to the other passengers. Listen to the elevator walls with your stethoscope. Stare, grinning at another passenger for a while, and then announce, "I have new socks on." Draw a little square on the floor with chalk and announce to the other passengers, "This is MY personal space!" A taxpayer received a strongly worded "second notice" that his taxes were overdue. "Oh," confided the collector with a smile, "we don't send out first notices. We have found that the second notices are more effective."